A module is the building block of your lessons. For example, you may create a module, unit, chapter, or lecture, for each week. A large majority of instructors organize their modules in weeks, adding lecture notes, activities, links, and resources that relate to that week’s topic as ‘sections’ of the week’s module. This allows them to guide learners through the sequence of content/tasks in an organized manner. A module consists of one module page AND one or more content sections, depending on how you want to organize your information. Module pages are like the title page of a document — on a module page you assign a title, add a description and keywords, if desired, and set the open and close dates the module is available. Content is published in section pages, which will be discussed in the next lesson. If you have a short topic, you may only want one section. If your module consists of multiple topics, resources, and materials, you want to break it up into several sections (meaningful chunks) for students for easier viewing and processing. When a student is reading a content section there will be breadcrumb links to next and previous sections, as well as the Table of Contents module list for easy navigation. Once in the course site you wish to work in, click Modules on the left navigation bar to go to the Modules area. There are four views for Modules: View, Author, Manage and Preferences. Preview and access modules and sections as they look to students. The default view for students shows all modules expanded to show their included sections and subsections. Students can contract the view to show modules only (no sections) by clicking on the double-headed arrow at the top of the list, or on any of the down-pointed arrows to the left of each module. Incidentally, modules that are not open to students (start date is in the future or end date is in the past), cannot be viewed by students. They will see the module title in the list but the link will not be active. They will be able to see the start and end dates so they’ll know when it will be available. 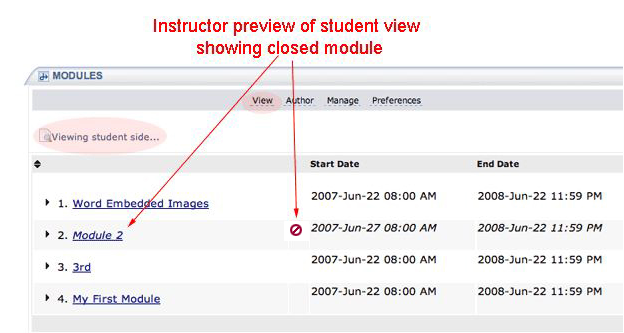 Those same closed modules are available to instructors in preview mode. The text will be italicized and an icon that signifies that it is inactive will show next to the module title. This allows instructors to work on their modules and then preview them even though students have no access. Add, edit, inactivate and delete modules and sections; set start and end dates; sort modules and sections; archive modules; and create next steps statements in the Author View. As with the student view of the modules list, the default list view is expanded. Instructors can click on the little black arrows to condense/expand the view to show sections or not. Instructors can also change the default so the list opens automatically in condensed view.